For 500 years European paper makers could only produce what came to be called Laid paper. In 1757 John Baskerville printed his famous edition of Virgil on a new kind of paper, called Wove (known in Europe as Vélin). This paper is now known to have been made by the elder James Whatman. Twenty-five years later (1780's) the manufacture of wove paper spread quickly to other paper mills in England, and was also being developed in France and America. All this took place over a decade before a machine to replace making paper by hand was conceived. With the establishment of the papermachine (1807), the manufacture of paper on a wove wire base never looked back. Today more than 99% of the world's paper is made in this way. The history of this development was documented in a three-volume work by John Balston. 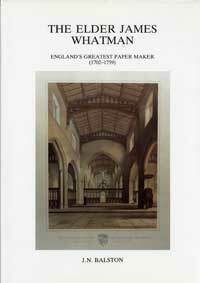 The first two volumes were published in 1992 as The Elder James Whatman, England's Greatest Papermaker. Volume I describes the part that the elder James Whatman played in developing the English papermaking industry. During his lifetime there was a huge change in the English market ceased to be dominated by imports, and local mills became a focus of innovation and excellence. 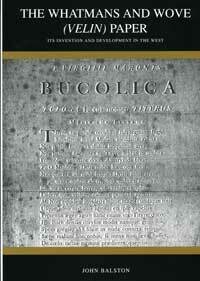 Volume II provides detailed evidence supporting the case in five appendices. 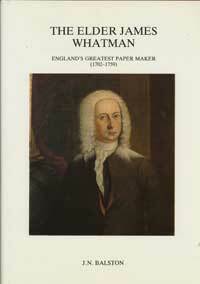 The third volume, The Whatman's and Wove Paper (1998), presents the evidence for James Whatman's greatest achievement, the invention of Wove paper, in the process shedding light on the world of two generations of papermakers and the process of technological innovation itself. This web site is largely based on material from that book. John Balston brought to this work two decades of research, the demanding standards of a perfectionist, and the practical experience of papermaking that came from working for more than 30 years for the famous papermaking company W. & R. Balston based in Maidstone. He was part of the last generation of papermakers who knew what it was to produce handmade papers in an industrial and competitive market. He really lived and worked in the world he describes. People responsible for the conservation of paper will find this work of great value through the insight it gives into the manufacturing process up to the early 19th century and the materials involved. Those with an interest in family history might be astonished by his researches into the paper making families in the Maidstone area (more than 150 people mentioned). His observations on the origins of modern drawing paper refer to the work of more than 40 artists, and are of direct interest to collectors of drawings and watercolours from the period 1780-1850. John Balston was himself an accomplished watercolourist. John Balston died on October 18th, 2000. He was aged eighty-five. He had devoted much of the last ten years of his life to producing the work on the Whatmans.